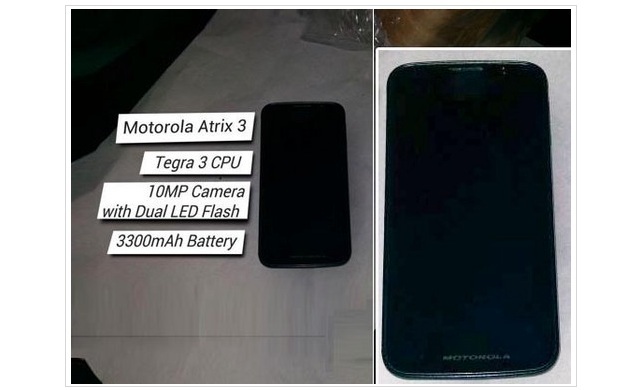 In the past Motorola has not been so much successful with its Atrix line of devices unlike the RAZR, but this is not stopping the company from introducing a new device namely the Atrix 3, of which a picture labelled with specs have been leaked. As you can see above, the device has the same designing pattern as that of the Atrix 2 and going by the specifications, the Atrix 3 will sport a 4.3 inch display with 720p. But then there is more, as the device is supposedly said to run on a quad-core Tegra 3 processor with 2 GB of RAM, yes 2GB it is. And well that’s not it; the Atrix 3 will come with a whooping 3300 mAh battery, which is the same that is found on the Droid RAZR Maxx. Now with this large battery, there is enough juice to run the device over 4G LTE for whole day. And then there is also a 10 MP camera with dual-LED flash. The Atrix 3 is expected to run Android Ice Cream Sandwich but then we don’t have any confirmation on this as of now. May be it will arrive with Android Gingerbread and then be upgraded to ICS. There is no information as to when we can expect Motorola to unveil the device officially, but then the MWC is approaching late this week so look out for this at the Barcelona event.